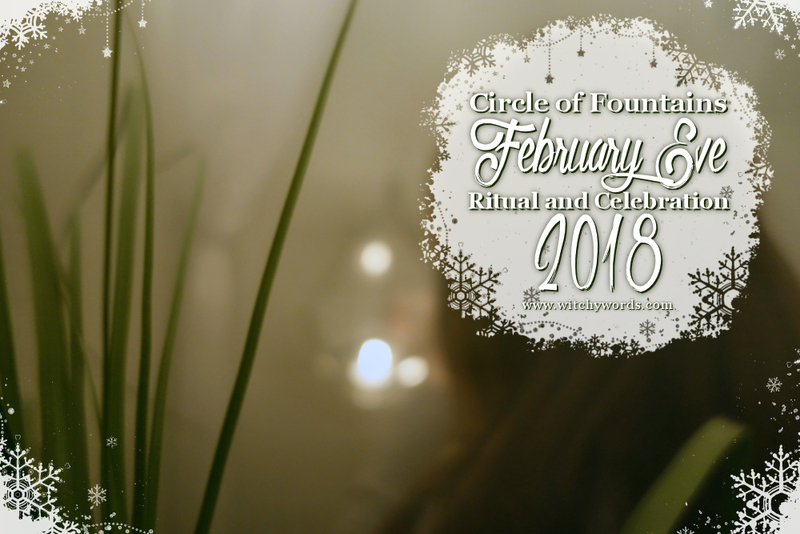 To see the Circle of Fountains 2017 February Eve ritual, click here! This year's Circle of Fountains February Eve ritual was written by Phaedra! Phaedra identifies as an agnostic Kitchen Witch with a heavy emphasis on home and family. During her time with Circle of Fountains, we have watched her practice deviate towards nontheism as her Craft evolves through study and experience. Her practice differs from other primaries who identify as Wiccan, hedgewitch, polytheist and more. We enjoy the immense variety of flavors that witchcraft has to offer as these differences help us to better understand the Craft as a whole. "To be honest, most of the inspiration for Imbolc was from a combination of a dream and a memory. I celebrated Imbolc with friends after losing my first pregnancy and our ritual helped me with my grief. I had a dream around November last year and all I could really remember when I woke up was being in our Circle room surrounded by candles, fog and us. Our focus was to prepare for the what’s ahead and celebrate the passing of the dark half of the year. I wanted to help us let go of things holding us back from growing." Ritual began with a crafting session! For the first craft, we made our very own Imbolc candles. 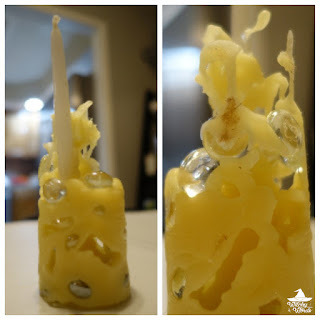 Utilizing toilet paper rolls hot glued to card stock, we filled the tube with glass dragon tears and ice to support a thin taper candle in the middle. This taper would primarily act as our wick. We then poured hot wax into the tube. Some of us even chose to add glitter to the top of our candles. The end result created this icy Swiss cheese look. Interesting! No two candles looked the same, either. Some didn't turn out as expected but were just as beautiful! We also created an anointing oil for Imbolc! Top off with grape seed oil as a carrier. ...roast beef, fried chicken, dairy free mac and cheese, chips and quac and a huckleberry copperhead to top it off. It was certainly a lovely dinner! After dinner, we then lined up to go into the ritual room! It was, um... a bit foggy. Phaedra began the ritual with a lotus-themed meditation, asking us to fold and unfold the petals around us as a peaceful grounding and centering. Afterwards, our most recent Novice graduate, Alisa, walked the outside of the circle with incense. As she did, a designated person called each quarter starting with east and moving clockwise. Phaedra then lit the center candles. "With the clean breath of air,with the passionate heat of fire,With the purifying power of water,with the grounding energy of earthwe cleanse this space." She then walked about the ritual room and lit candles. As she did, she spoke of letting go, of release. "Out with the useless and in with useful," she said. "I prefer that over old and new because old isn’t always bad and new isn’t always good." "The last group Imbolc I did this at, I let go of the part of my grief for [my son] Owen that was stopping me from living again. One of my first solo rites for this sabbat, I released the garbage from my abusive childhood. Letting go tonight is a start to changing yourself, hopefully for the better." She asked us each to pull out whatever it was we brought with us to burn at the ritual. This item would represent something that we needed to remove from our lives, something that no longer served us. Everyone released something different. For Kolika, it was a piece of a hat that her dog tore apart. She kept it, swearing she'd fix it but never did. In that, she was releasing incomplete projects that had no need to be finished. Amy burned a piece of paper with "IOU" written on it, representing her need to change herself for other people, becoming who they need her to be rather than who she truly is. For me, I burned a pill bottle label specifically from my anxiety medication. I often talk about letting go of my anxiety, of being someone else during an attack. I distance myself from my illness, swearing that it isn't me, because it embarrasses me. I'm typically so organized, responsible and put-together. I'm none of those things when I'm having an attack. But that doesn't mean that that person isn't me, that I can't accept her for the part of me she is. I'm done hiding her or being embarrassed of her. And so I released that embarrassment of my mental illness. 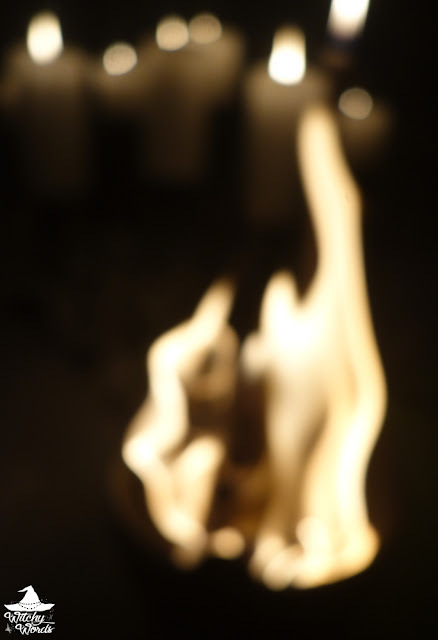 Once everyone had burned their items, Phaedra then asked us to find a flame in the room that called us. Using that flame, she was going to walk us through a scrying meditation. As she spoke, we looked into the flames to see if we could pull any images from them. Finally, the last part of the ritual was a cleansing. After releasing what no longer served us and gathering images for the path ahead, we were going to cleanse one another to leave the ritual renewed. This specific cleansing utilized the elements: A flame for fire, an herb bundle for air, salt for earth and purified water for water. Seeing our two graduated Novices cleansing each other filled my heart. Two of the familiars also got in on the cleansing action. We were, of course, very cautious with the herb bundle as smoking herbs can be hazardous for pets. At the end of the ritual, Alisa walked the outer circle with a fan counterclockwise. And each person who called each quarter then released it. The circle is open, but unbroken. Merry meet and merry part and merry meet again! From my circle to yours, I hope your February Eve was as blessed as ours! Best wishes to you and yours!